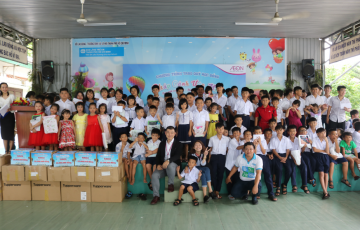 Operating with the precept “Japanese Heart, Vietnamese Smile”, AEON MALL Tan Phu Celadon has not only brought the best quality products and services to customers, but always aims to bring useful values for the local community. 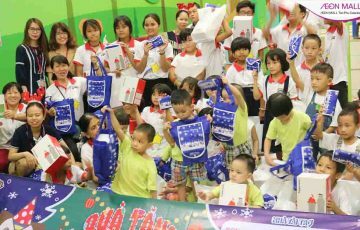 Within 5 years since its operation (2014 – 2018), AEON MALL Tan Phu Celadon has accompanied with many local people’s lives through meaningful social activities, which contribute to the common development of the community. Specifically, on November 24th, 2013, more than 1,000 people including local customers and employees working at AEON MALL Tan Phu Celadon participated in planting activity on the occasion of AEON MALL Tan Phu Celadon shopping center opening. 8000 trees have been cultivated and grown up since then, bringing urban beauty as well fresh atmosphere to the local area. Nowadays, planting activity is really a necessary action in the polluted climatic condition and extreme weather in major cities of Vietnam. This activity is also a tradition maintained whenever a new shopping center of AEON Group is built. Along with the development of the shopping center, AEON MALL Tan Phu Celadon expects that the act of planting green trees will contribute to the development of the community by building a green and clean living environment for everyone. In addition, AEON MALL Tan Phu Celadon also carried out monthly garbage picking activity around the shopping center area. This activity helps to clean up the area around the mall as well as raise awareness of local staff and people in preserving a clean and beautiful living environment. Accompanying in all aspects of customer life, AEON MALL Tan Phu Celadon has become a typical Japanese shopping center and different from most other centers. With the dedication to work with “Japanese Heart”, AEON MALL Tan Phu Celadon has not only been a simple shopping center but a factor to help build and spread the spirit of Japanese standard lifestyle, bring satisfaction and “Vietnamese Smile” for all customers. Through the precept of “Japanese Heart, Vietnamese Smile”, AEON MALL Tan Phu Celadon conveys the desire to serve customers with all their heart, take customers’ smile as the motivation to support customers to get the best quality of life.